I got everything to function with a rather messy board setup as shown below. 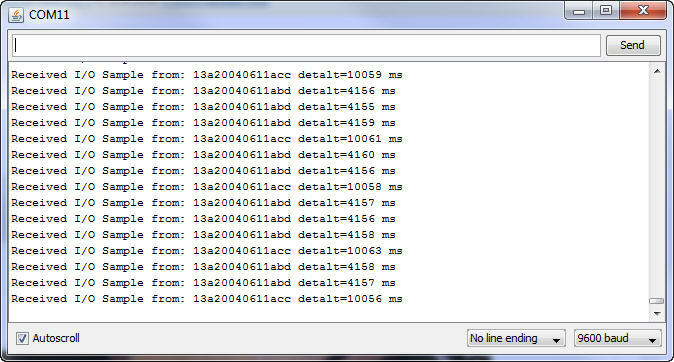 The output from the Arduino shows the delta T between messages received from the end-devices. It is pretty close to the calculated ones. I will change the duration to be 15 minutes later on but for debugging purposes 10s intervals for pin sleep is tolerable. Well everything is wired up and works as planned. Sort of. The journey there was not simple. 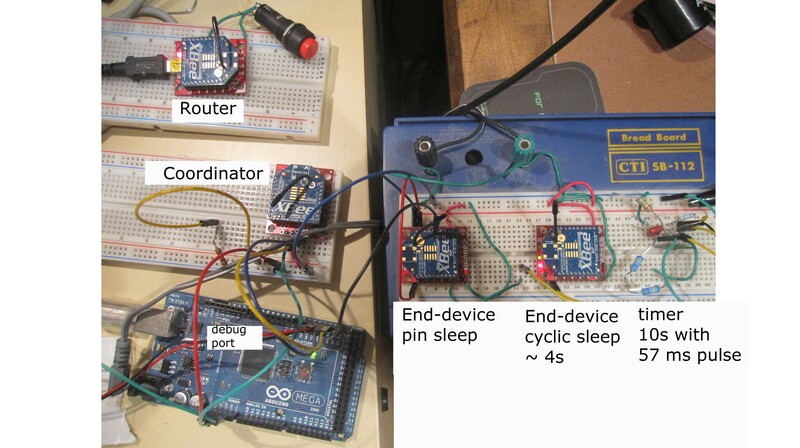 The datasheets on the xbee around sleep modes covers everything one needs to set that up. The problem is that it is not a first pass approach for a newbie. I had to scratch my head a few times. Upgraded to wordpress 3.2. Quite painless. I received my components from digikey to finish the mesh based data collection prototyping. One of the components is the LTC6991 timer chip. I never soldered surface mount devices before so I did my share of reading up on it. Mine turned out functional but not the best looking. Hats off to those who make it look easy. The IC is TSOT-23 and I purchased a breadboard friendly board to solder it to.